We&apos;ve done a couple of posts on Simbla, the responsive website builder, as it has grown over the years. 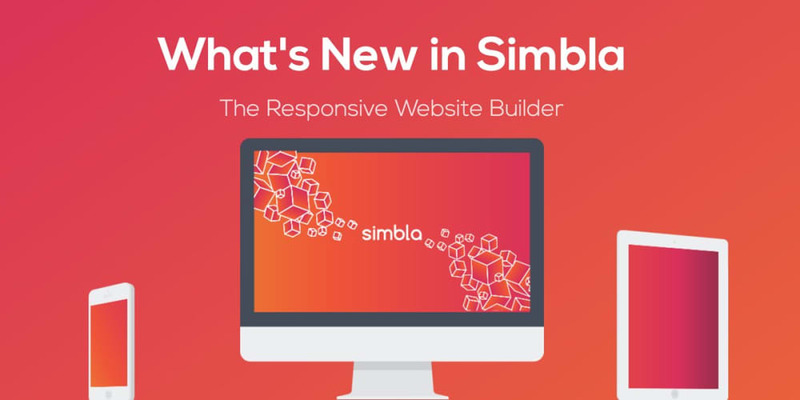 Simbla is a neat service that is the perfect tool for building responsive websites at any skill level. It doesn&apos;t matter if you&apos;re a complete beginner who doesn&apos;t understand code or a seasoned developer, Simbla has options for you! You can build a quick responsive website that looks good or a complex web application with custom functionality. Simbla has good options for all types of projects. Their team of developers and designers have been very busy working hard and has released a ton of new new features! In this post, we&apos;ll do a recap on how some of their features can benefit you and the exciting new features. Simbla started as a Bootstrap responsive website builder providing options for new users and professional developers. Now, Simbla has grown into a fully featured whole solution for businesses. Read the following short descriptions about some of their features that we&apos;ve talked about before. Simbla has some of the best responsive website templates that look good out of the box. They also have a ton of customization options to making your website personal to you. Simbla beat out other website builders because it also allows you to manage your own online database. You can create and edit various databases and integrate them into your custom designed templates with very little overhead or coding skills. Originally, Simbla was providing small online database widgets that you could customize and add to your website. Simbla has improved this by allowing you now build full-blown web applications. We&apos;ll cover this a bit more in their new features section! So keep reading to learn a bit more. Simbla doesn&apos;t just limit you to restricted templates, you actually build and customize the websites you want to. They build an extremely easy-to-use user interface for allowing you to drag and drop website sections around. This allows you to fully customize websites with ease. One of the best new features that the Simbla team has pushed out is a brand-new App Market. The App Market offers full functional web apps for your Simbla project! As you can see, the App Market will be home to all your business&apos;s professionals needs. With the digital age of everyone and anyone having access to the Internet, it&apos;s sometimes essential that you that your business be more than a simple website. The App Market allows you to quickly and instantly get comprehensive business solutions to customers with almost no overhead! Ready-made applications on Simbla&apos;s platform is the next generation of website building systems. The best part about this is you Simbla will constantly be updating the App Market with new and great things. The possibilities are endless. You can tell that they have some seriously awesome business-solutions in the works. If you&apos;ve operated in this environment before, you can definitely tell to what the next new feature is. Keep reading to find out! If you didn&apos;t already figure it out, part of what&apos;s in the works with the whole App Market is a fully fledged out CRM system. Things like Lead Management, Email Marketing, and more straight on the Simbla Platform. This is in the works and probably will be rolled-out in phases, but by the end of year they will have a functional and one-of-a-kind CRM system that integrates directly with your website. So, imagine this scenario for the future and the true power: You built your website with Simbla for your business. It&apos;s responsive, it&apos;s highly designed, and it&apos;s up and running within a day using their platform. You decided to add a database widget for showing different services or products that you have. Next, you add a form for contact. This works well but you want to take it further than before. So you decide to add CRM integration to your Simbla website via the App Market. You now have analytics tracking leads, targeting customers, and collecting emails from potential clients. From there, you use Simbla for your email marketing to follow up and convert your leads! This all happens from a single web platform. One of the biggest pains I&apos;ve personally deal with when working with clients is integrating their CRM system with their CMS. With Simbla, this is all in one place making things effortless fore everyone. Admin&apos;s have full control on how their apps will look, behave, work. They even allow you to customize the admin dashboard. For developers you can see how nice it will be to code on a single platform. You truly can make something extremely powerful. As I was saying, Simbla isn&apos;t just a simple website builder. Originally, you could only add database widgets to your projects making simple custom database driven "components". Now since Simbla has expanded their functionality you can do much, much more. Their dynamic grid allows you to automatically inject data from your database into a set layout by choosing which fields the data will come from and in which order to present it. The great thing about this feature is that developers only see it as regular text (or a variable). They can literally drag it around and place it anywhere on the website that they&apos;re building. This means that they can change the style and design all dynamically from the custom database. Developers can tell that this has huge potential and basically removes any handcuffs. You essentially have full freedom to build full web apps on the system. Simbla has added SSL! You can now make any of your websites server HTTPS by default. This is huge because customers and visitors care about security in this day and age. It&apos;s also extremely validating to a user knowing that what they&apos;re visiting is secure. Ultimately, you can look at Simbla as an easy-to-use digital platform for businesses. They can handle anything from simple websites, to complex custom build website applications, and now to a complete business solution with CRM and other customer management options!